On February 28th in 2009, Jason Spezza of the Ottawa Senators mishandled a clearing attempt and scored an own goal on his backstop Brian Elliot, giving their Northeast division rival Toronto Maple Leafs a 2-0 lead with four minutes remaining in the first period. The miscue was credited to Maple Leafs rookie Tim Stapeton, the first goal of his NHL career. Ottawa answered with three straight to lead 3-2 before Toronto tied it up, as the second overall pick from the 2001 Draft sat in the sin bin for hooking. Toronto won the game in overtime 4-3. Before setting out on any journey it's crucial the goal be defined. With this in mind, Team Canada coach Mike Babcock sat down with advertising guru Rick Larsen to pen the purpose of Canada's Olympic residence. 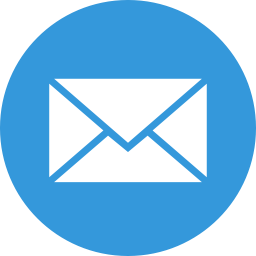 The resulting text was posted in the team's dressing room for the tournament. That this isn't about us, it's about our country. That we know 33 million Canadians will attend every game. That home ice is an advantage. That nothing can distract us. That nothing will stop us. That our determination will define us. That we are built to win. That we are a team of character. That we are a team of destiny. And on February 28th Canada beat the USA 3-2 to win gold . . .
. . . leaving no doubt. Well done boys, you've made your country proud. * See also Today In NHL History - Canada Wins Gold (2010). On February 28th in 2010, Team Canada beat Team USA with a golden goal in overtime of the gold medal game of the 2010 Winter Olympics in Vancouver 3-2, marking the second time in eight years the two teams played for gold with Canada coming out on top. With Canada leading 2-0 midway through the match on goals from Jonathan Toews and Corey Perry, Vancouver Canucks forward Ryan Kesler put USA on the board late in the second period and Zach Parise tied the game with 25 seconds remaining in the third period. Sidney Crosby scored the overtime winner seven minutes into the extra frame and Canucks goaltender Roberto Luongo collected the win. The entire game may be seen here with a comprehensive oral history here. * See also Team Canada's 2010 Olympic Motto. * See also Today In NHL History - Canada Wins Gold (2002). On February 27th in 1994, Peter Forsberg scored a Kent Nilsson-style goal against Canada's Corey Hirsch giving Sweden their first gold medal in a 3-2 shootout win in Lillehammer and landing himself on a Swedish stamp. The deke, since dubbed The Paralyzer, has been repeated by Finnish forward Jussi Jokinen in several NHL shootout attempts. The inaugural effort, authored by Elitserian Golden Puck winner Mr. Magic, was a game winning goal leading Sweden past USA by a score of 4-2 during the 1989 World Ice Hockey Championships. That's today in NHL history. On February 26th in 2006, Sweden defeated rival Finland 3-2 in Turin claiming their second ever Olympic gold medal, 12 years after their first. The full match may be viewed here. * See also Today In NHL History - Forsberg's Shootout Gold. 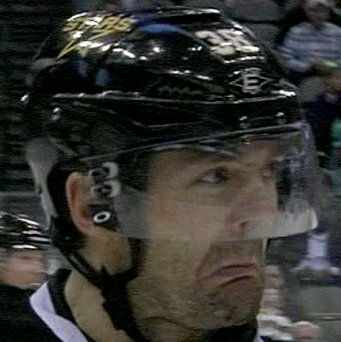 On February 26th in 2012, Dallas Stars forward Vernon Fiddler skated past the Vancouver Canucks bench with three minutes remaining in a scoreless first period, delivering a deadpan impersonation of blueliner Kevin Bieksa complete with angry face and choppy stride. 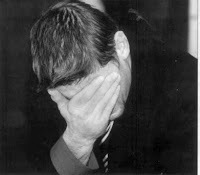 The performance, staged mere hours before the 84th Academy Awards, gave Bieksa a belly laugh but sent head coach Alain Vigneault into a laughing fit lasting more than a minute - an earnest display of amusement rarely exhibited by a bench boss during a match. A week later Bieksa discussed the incident on CBC's After Hours noting that Fiddler's not the first to attempt the death stare, "there's a couple of other muppets around the league that have been trying to do it". Dallas beat Vancouver that afternoon in overtime by a score of 3-2. 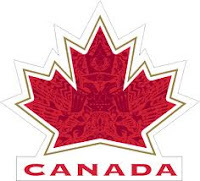 On February 24th in 2002, Canada beat USA at the 2002 Winter Olympic Games in Salt Lake City by a score of 5-2, winning the country's first men's ice hockey Olympic gold medal in 50 years. Despite Executive Director Wayne Gretzky's expertly assembled squad and a pair of goals from each of Joe Sakic and Jarome Iginla, some attribute the win to Canadian born icemaker Trent Evans buring a loonie at center ice. Others claim the country was due. Either way, the final ignited a bitter rivalry between the sides that remains to this day. On February 23rd in 2010, Nashville Predators blueliner Shea Weber suited up for Canada at the 2010 Winter Olympics and blasted a slapshot past San Jose Sharks German goaltender Thomas Greiss that tore through the net. When questioned whether Weber had ever witnessed a puck go through the net, the deadpanned defenseman remarked, "Yeah, I do it every day". Canada beat Germany that night by a score of 8-2, eliminating them from the 2010 Winter Olympics men's ice hockey tournament. On February 21st in 1998, the Czech Republic beat Russia 1-0 to capture the gold medal in the Winter Olympics Games in Nagano, the first such tournament involving NHL athletes. The lone goal came from Petr Svoboda with Dominik Hasek collecting the shutout. On February 21st in 2000, Marty McSorley of the Boston Bruins swung his stick and struck Vancouver Canucks forward Donald Brashear in the head with three seconds remaining in the third period, rendering him a bloodied, unconscious and convulsing mass. Presumably intended to target the shoulder and spark a rematch to a first period scrap, the vicious miscue came dangerously close to killing Brashear. With doctors attending to the unconscious Canuck, goaltender Garth Snow skated the length of the ice to fight McSorley as fans littered the ice with debris and officials attempted to remove him from the rink. Initially suspended by the NHL for the final 23 games of the season (forfeiting $72,000 in pay), the league extended the banishment to one full year after McSorley was charged, convicted and sentenced by a Canadian court to 18 months probation for assault with a weapon. McSorley never skated again in the NHL. The assault remains the last act of the 4th all-time penalty minute leader's 17 season storied career. 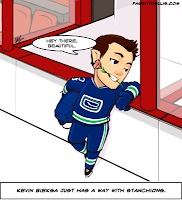 The Canucks beat the Bruins that night by a score of 5-2. On February 20th in 2015, Colorado Avalanche defenseman Brad Stuart flipped a 92 foot center ice wrist shot past Chicago Blackhawks goaltender Corey Crawford with just over five minutes remaining in the final frame at the United Center. Crawford's miscue came as the third goal allowed in just three minutes, breaking a 1-1 tie through 51 minutes. To be fair, the preceding pair were powerplay markers, including a 5 on 3 score. The goal was Stuart's second of the season, keeping him on pace to match his prior year production of three goals. The Avalanche held on to beat the Blackhawks by a score of 4-1. On February 20th in 1998, Pavel Bure scored five goals in a single Olympic game leading Russia to a 7-4 semifinal win over Finland. Two days later, however, the captain and his comrades were blanked by Domink Hasek losing 1-0 to the Czechs in the gold medal game. Bure finished the tournament with nine goals in six games and was named the top forward at the Winter Olympic Games in Nagano. On February 20th in 1998, Dominik Hasek shutout Canada in a semifinal shootout to carry the Czechs to the gold medal game in Nagano. 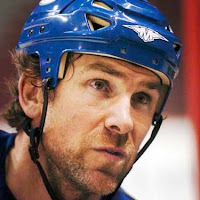 Tied 1-1 at the end of regulation with goals from Jiri Slegr and Trevor Linden, the teams engaged in an Olympic ten minute overtime and ultimately a shootout to settle the score. Of the Canadian shooters (Theo Fleury, Ray Bourque, Joe Nieuwendyk, Eric Lindros, Brendan Shanahan) none beat Hasek. Of the Czechs selected (Robert Reichel, Martin Rucinsky, Pavel Patera, Jaromir Jagr) only Reichel beat Roy. In light of the loss, Coach Marc Crawford was widely criticized for selecting Bourque to shoot instead of proven scorers Wayne Gretzky or Steve Yzerman. He defended his choice claiming Bourque's accuracy outweighed Gretzky's apparent mediocre breakaway success. On February 19th in 1998, the US men's hockey team disgraced their country, the NHL, and themselves by vandalising the Olympic village in Nagano after losing 4-1 to the Czechs and being eliminated from the Games. Their childish frat boy antics resulted in extensive damage to the residences including broken chairs and emptied fire extinguishers that were then tossed from their 5th floor perch. Making matters worse, the cowardly culprits left Japan without an apology reinforcing the 'Ugly American' stereotype abroad in the first Olympics with NHL players. Chris Chelios, captain of the 6th placed team, later issued an apology and sent a $3000 check to cover the damages. No names were uncovered in Bettman's investigation though with a roster featuring Roenick, Tkachuk, and Hull it's not hard to imagine who might be responsible. On February 17th in 1998, Ulf Samuelsson was dismissed from Sweden's hockey team and sent home from the Winter Olympic Games in Nagano when officials deemed he was no longer legally a citizen of Sweden on account of his receipt of a U.S. passport. What started as an off-hand post-practice comment from Sports Illustrated hockey writer Michael Farber to Swedish journalist Janne Bengtsson ("Why would we give a dirty player like that U.S. citizenship?") sparked an investigation into the legalities of dual citizenship, or lack thereof, revealing that under Swedish law the acquisition of a foreign passport annulled local citizenship. The next day Bengtsson confronted Sweden Ice Hockey Association President and IIHF council member Rickard Fagerlund with his findings during the first intermission of Sweden's match with Belarus. 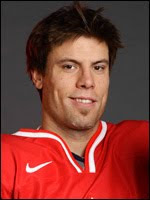 During the second period team manager Bo Tovland confirmed Samuelsson's possession of a U.S. passport and thus his ineligibility to play for Sweden. Despite being allowed to keep the points collected with an ineligible player, Sweden lost 2-1 to Finland in the quarterfinals finishing fifth in the tournament. Bengtsson returned home to death threats and a devastated Samuelsson never suited up for his homeland again. On February 17th in 2009, Vancouver Canucks defenseman Willie Mitchell skated through a pre-game warmup against the Calgary Flames with an 80 inch stick in response to coach Mike Keenan's accusation of illegal lumber. Mitchell, who plays with a league maximum 63 inch stick, invited Iron Mike to borrow his tape measure and take a shot at Rule 10.5. Keenan declined the offer, refusing to test the twig. Vancouver beat Calgary that night 4-3 with big Willie picking up an assist on the evening. * See also Today In NHL History - Jason Spezza's Illegal Stick. * See also Today In NHL History - McSorley's Illegal Stick. On February 10, 2008, Florida Panthers forward Richard Zednik had his throat inadvertently slit by the skate blade of falling teammate Olli Jokinen midway through the third period of a match against the Buffalo Sabres. Despite spilling five pints of blood, doctors performed emergency surgery and managed to save Zednik's life. He was released from the hospital six days later and met the press four days after that to share his story. Zednik missed the remainder of the season, returning the following year to earn a Masterton nomination. The incident marked the second such skate blade throat slashing Buffalonians had witnessed, the first being Sabres netminder Clint Malarchuk's accident 19 years earlier. After a 15 minute delay to remove the blood and upon learning that Zednik was in stable condition, NHL VP Colin Campbell elected to complete the game. Buffalo beat Florida that night by a score of 5-3. * See also Today In NHL History - Malarchuk's Throat Slit. On February 7th in 1976, Darryl Sittler of the Toronto Maple Leafs collected 10 points (6G, 4A) on 10 shots in a single NHL game against goalie David Reece, including hat tricks in the both second and third periods, en route to an 11-4 win over Adams division rival Boston Bruins. The performance broke the previous single game point record of eight originally set by Maurice Richard in 1944. Sittler's record survived the Gretzky and Lemieux era and stands to this day. 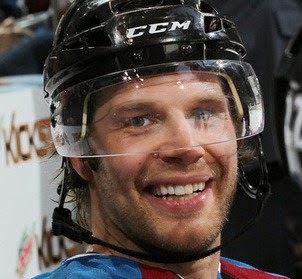 "Wrong Place at the Wrong Time" Reece never played another game in the NHL. On February 7th in 2009, Burnaby-born crooner and Vancouver Canucks fan Michael Buble took part in his most famous duet to date taking a turn in Tom Larscheid's shoes to color John Shorthouse's call. Buble delivered a healthy dose of hometown bias to the play-by-play broadcast including a cover of Paul Leka's anthem midway through the match en route to the Canucks 7-3 win over the Chicago Blackhawks. Humbled by the experience, the part owner of the Vancouver Giants praised Larschied acknowledging the difficulty of the job, and invited Shorthouse onstage to sing "Feeling Good" when he next plays in town. Eighteen months later the pair reunited in song for a tweaked rendition of "Thanks for the Memory" to honor the recently retired Tom Larscheid in front of a sold-out hometown audience at Rogers Arena. On February 4th in 2012, Vancouver Canucks blueliner Kevin Bieksa made a spectacular diving save to prevent an empty net goal by T.J. Galiardi with 48 seconds to play, then fired a stanchion-deflected puck past goalie Jean-Sebastien Gigeure 14 seconds later to tie the game. A complete analysis of the stanchion-assisted effort, courtesy of The Province's The Legion of Blog, may be found here. Bieksa's history with stanchion-deflected goals is well-documented, the most famous of which came in double overtime of Game 5 of the Western Conference Final eliminating the San Jose Sharks and advancing the Canucks to their first Stanley Cup Final in 17 years. After a scoreless overtime, Mason Raymond collected the shootout's only goal to complete the Canucks unlikely 3-2 comeback against Colorado. 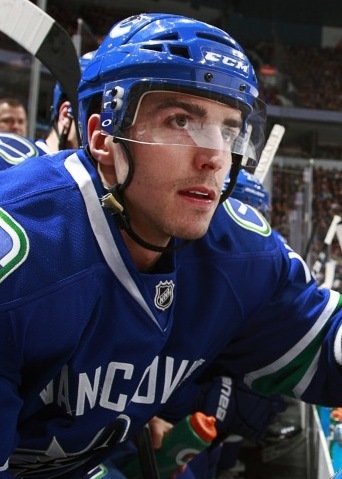 On February 3rd in 2009, Vancouver Canucks undrafted forward Alex Burrows snapped the club's 8 game losing streak (and 9 game home losing streak) in dramatic fashion converting a shorthanded breakaway with his signature forehand-backhand move against the Carolina Hurricanes unlocking a 3-3 tie with 82 seconds to play. Burrows celebrated the crucial marker mimicking the snapping of his stick over his knee, acknowledging the end of the streak. The Canucks killed the remaining 25 seconds of Carolina's powerplay and held on for the final 57 seconds of the game to win by a score of 4-3. During their 2009 win-less span, the Canucks' win-loss record slipped from 22-15-5 to 22-20-8. Burrow's shorthanded goal, however, sparked the club to win 23 of their remaining 32 games, finishing the season with a 45-27-10 overall record and clinching the Northwest Division title. Likely saving Canucks head coach Alain Vigneault's job with the win, Burrows was tested on the team's top line with twins Henrik and Daniel Sedin two games later. Sensing the chemistry between the trio, GM Mike Gillis wisely quadrupled Burrows' $525,000 salary three weeks thereafter with a four year contract paying $2 million per year. The top-line experiment proved fruitful for all involved, with Henrik and Daniel Sedin leading the NHL in points in successive years (2010, 2011) and Burrows posting four consecutive 25+ goal seasons (2009-2012). This streak-snapping celebration was repeated three years later when Burrows scored a game-winning shootout goal on Jimmy Howard with the same forehand-backhand move to beat the Red Wings 4-3 at the Joe, ending Detroit's NHL record setting 23 game home winning streak. On February 2nd in 2011, New York Islanders netminder Rick DiPietro shoved Pittsburgh Penguins pest Matt Cooke setting off a scrum with 17 seconds to play. In response, Pittsburgh's backup backstop Brent Johnson skated the length of the ice to engage DiPietro in some fisticuffs. Johnson won his first NHL fight dropping DiPietro with one punch, earning 17 penalty minutes for his efforts. The Islanders oft-injured $67 million dollar man was less fortunate, sustaining facial fractures and knee swelling that sidelined him for six weeks. DiPietro played in only 15 more NHL games after the now-famous goalie fight before being bought out by the Islanders for $24 million on July 1, 2013. 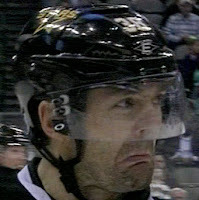 Johnson appeared in 25 more NHL games, his last being on April 15, 2012. Amazing, DiPietro and Johnson ended their respective careers with nearly identical numbers. DiPietro appeared in 9 more regular season games (318 vs. 309) and 5 fewer playoff games (10 vs. 15) than Johnson, managing a marginally poorer goals against average (2.87 vs. 2.63) and save percentage (.902 vs. .904), though with a far lesser team. Financially, DiPietro's NHL contracts ($71.1m) paid 20 times more than Johnson's estimated earnings ($3.35m), a distinct advantage that continues with annual payments of $1.5m scheduled through 2029. Pittsburgh beat New York 3-0, though Johnson's ejection cost him the shutout with Marc-Andre Fleury entering to complete the game. 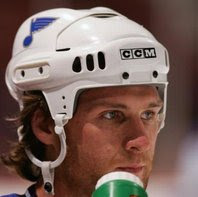 On February 2nd in 2006, St. Louis Blues defenseman Dennis Wideman famously flubbed a shootout attempt against Chicago Blackhawks rookie goalie Corey Crawford, awkwardly falling before managing a shot on net. The shootout miss remains a favorite among NHL hockey bloopers. The Blues eventually beat the Blackhawks that night by a score of 6-5. On February 1st in 1993, former NBA senior vice-president and general counsel Gary Bettman was appointed Commissioner of the NHL. 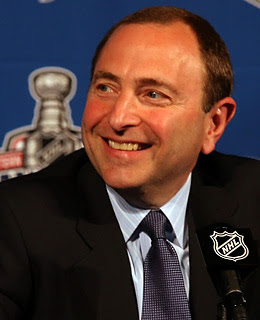 As clever as he is unpopular, Bettman has brought tremendous change to the game introducing and alienating fans alike. three work stoppages (104 days during the 1994-1995 season, entire 2004-2005 season, 119 days during the 2012-2013 season). When not working to improve the game and line owners pockets with increased revenues, he can be found being booed in arenas league-wide.